Christina Hendricks was a presenter this evening(November 111th) at the 44th E! People's Choice Awards at the Barker Hangar in Santa Monica, CA. 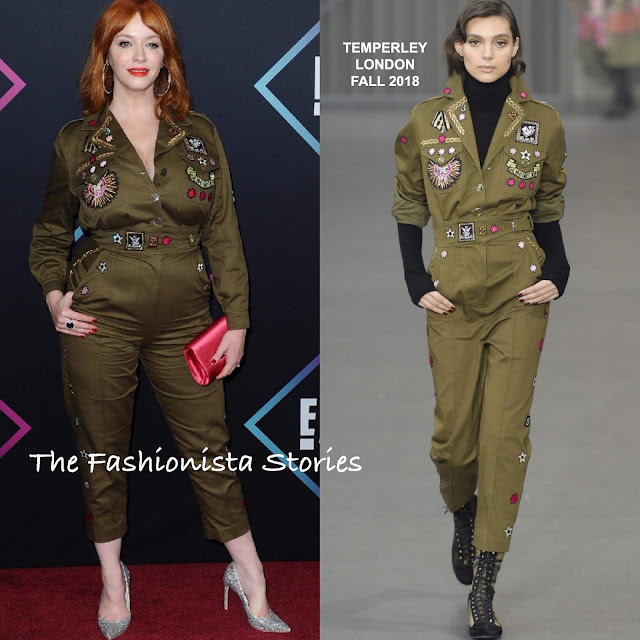 Christina's style can be hit or miss but I am digging her in this TEMPERLEY LONDON FALL 2018 jumpsuit which seems like an ode to veterans day. The 'Memento' moss green boilersuit was adorned with colorful patches and featured a cinched waist and center front, button closure. While the model looks great in this jumpsuit, I actually prefer it more on Christina. She fills it out perfectly. However I don't really like her glittery pumps with it but the pink satin clutch works. What do you think of Christina's look?